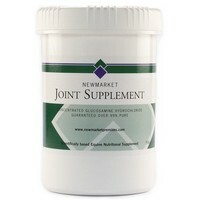 Newmarket Joint Supplement is the most concentrated form of Glucosamine on the market today. Each batch is made to the most exacting standards from natural raw materials and is guaranteed by Europe's leading equine forensic laboratory to contain over 99% Glucosamine Hydrochloride. Suitable for dogs over 15kg. Bought for our old golden, really gave her upset tummy, no signs helping her either.